To see the number of results: check the banner's top, left corner. If you have too many, use the left column options/limiters and different keywords and phrases to narrow your topic. To narrow your results: use phrase searching. Enclose your keyword phrase in quotation marks. The database will return results using that phrase, not just the individual words in the phrase. You get more focused results. Change one option/limiter at a time. Each one you choose will focus your results even more. If you change your search terms in any way, you have to choose the options again. Cuesta Library Search makes it easy to find books, journal and magazine articles, eBooks, videos and streaming media from a single search box, with one list of results and options for refining them. These include full text articles, videos and eBooks. Click on the Full Text button on the left-hand side of the screen if the full text article does not appear. 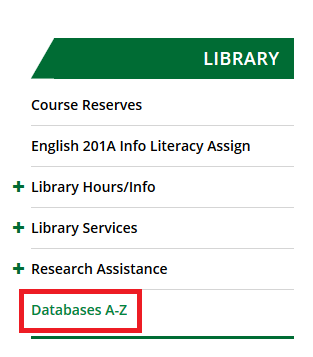 If want to view a complete list of the databases the library subscribes to, or to go directly to a specific database, click on the Databases A-Z link from the Library home page or under the Resources tab in myCuesta.